We’d love your help. 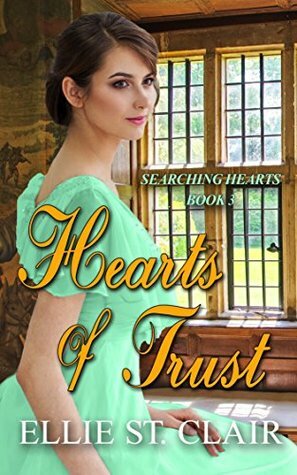 Let us know what’s wrong with this preview of Hearts of Trust by Ellie St. Clair. Sophie Carmichael was devastated by the death of her parents in a carriage accident and After nearly ruining a young woman of the ton, well-known rake Benjamin Harrington is sent to manage his father’s floundering country estate. Determined to prove himself, Benjamin must fight the temptation presented by his beautiful new maid, who quite literally stumbles into his path. To ask other readers questions about Hearts of Trust, please sign up. After loosing her family in a tragic accident, Sophie is made a ward of her cousin , but he has evil in mind for her future that she’s not altogether happy with,to say the least . She decides to run away, and masquerade as a maid to keep away from him , but doesn’t count on falling for her employer. I don’t want to put spoilers so I’ll not go further , but you should , Ellie always writes such wonderful stories , keeping you engaged and hoping for a HEA, she never disappoints . Benjamin Harrington, third son of the Duke of Ware, is a wastrel. His parents encourage him to change his ways and redeem himself by exiling him to one of their estates and challenging make it profitable. If he fails, he will be disinherited. Sophie Carmichael is orphaned when her parents die in a carriage accident. She goes to her only relative, her lecherous cousin Malcolm, the Earl of Dunstable. Because of his abusive nature, the Cook arranges with her sister, a housekeeper, for Sophie to esc Benjamin Harrington, third son of the Duke of Ware, is a wastrel. His parents encourage him to change his ways and redeem himself by exiling him to one of their estates and challenging make it profitable. If he fails, he will be disinherited. Sophie Carmichael is orphaned when her parents die in a carriage accident. She goes to her only relative, her lecherous cousin Malcolm, the Earl of Dunstable. Because of his abusive nature, the Cook arranges with her sister, a housekeeper, for Sophie to escape to a distant estate where she can work as a maid. By coincidence, that estate is where Benjamin is sent. He is unaware that the new maid is really a lady in disguise. The story reveals how Benjamin and Sophie adapt to their changed circumstances and overcome the obstacles to their Happily Ever After. The very first thing I enjoyed about this book is the sweet cover and title. The heroine, Sophie, is just a dear young lady who finds herself an orphan and being treated quite poorly by her cousin. I admired her strength for running away from him and agreeing to become a servant to remain safe. Benjamin, as most second or third sons during these times, was a rogue with no sense of direction. Thankfully, his parents recognized the need for him to grow up and take on responsibilities. Thankfully, h The very first thing I enjoyed about this book is the sweet cover and title. The heroine, Sophie, is just a dear young lady who finds herself an orphan and being treated quite poorly by her cousin. I admired her strength for running away from him and agreeing to become a servant to remain safe. Benjamin, as most second or third sons during these times, was a rogue with no sense of direction. Thankfully, his parents recognized the need for him to grow up and take on responsibilities. Thankfully, his new estate came with a new maid who was both smart and beautiful. Sophie remained strong throughout the entire book even during fearful situations. With each page, I hoped that would find her happily ever after. Ms. St. Clair continues to deliver interesting plots and characters with each book she writes. I quite enjoy this series and look forward to the next installment. Lady Sophia Carmichael is now an orphan. She lost her parents and her cousin came to take over. Everything started out find but he changed. He felt he owned her and he alone. She was so afraid of him, he abused her physically,and mentally. Finally she could take no more and with the help of the servants ran away. Lord Willem Wakefield is the third son of the Duke of Ware, He is an awful Rake and his dad is always angry with him. He gets banished to the country and given a choice. This was a grea Lady Sophia Carmichael is now an orphan. She lost her parents and her cousin came to take over. Everything started out find but he changed. He felt he owned her and he alone. She was so afraid of him, he abused her physically,and mentally. Finally she could take no more and with the help of the servants ran away. Lord Willem Wakefield is the third son of the Duke of Ware, He is an awful Rake and his dad is always angry with him. He gets banished to the country and given a choice. This was a great read, the way the servants watch out for her. Benjamin tried so hard to change but it was so difficult for him. The characters were generous of heart, kind and protective. The story was able to keep your interest in the tale until the end. It was exciting and had lots of action. Caught between a nightmare with her cousin and freedom with a rake, what's a lady to do? Lady Sophie Carmichael is now an orphan, and at the mercy of the cousin who has inherited her father's estate and the care of her, but he's a lecherous, evil drunk. Her quest for freedom takes her to the employ of a rake in need of reforming. What will she do? You'll find yourself yelling at the decisions she makes but what's a lady to do? Another great novel from Ellie St Clair. The hero and heroine were both likeable characters, while the 'villain' was a dirtbag. It has a good storyline and interesting characters throughout, but like so many romance novels is quite predictable. A few spelling and grammar errors, but getting the heroine's name wrong was quite distracting. I did enjoy the book, but the errors and predictability make it only four stars from me. What is a lady to do when her cousin who is also her guardian tries to push his affections upon her repeatedly? You run away to become a maid where no one knows you. Except her accounting skills end up have her working with the wealthy son running the estate. He sees something different in her and begins to rethink his rakish ways. But her cousin may cause a huge problem if he doesn't find out the truth in time. I received a complimentary copy and I am voluntarily reviewing. Sophia Carmichael had lost her parents in an accident and she was left to live with a cousin who was the next Earl. His wanted her inheritance so decided she would marry him. Employees helped her to escape and pretend to be a maid til she could figure what else to do. The well-written story about a woman in hiding and the man whose home she hides in as a maid. Sophie also starts to help Benjamin with the estate books, but Sophie is hiding from an evil man. What happens when she is found? A story that kept me wanting to know what was going to happen. I was given a copy and I am voluntarily reviewing it. She escaped the clutches of her evil cousin only to become a maid in the home of a scoundrel. Can the love of a good woman redeem this rogue? Can Sophie truly escape her cousin who was intent on ravishing her? I enjoyed reading Benjamin and Sophie's story and finding the answer to these questions. Such a lovely book. Poor Sophie is tooken in by a cousin a duke none the less whom is a horrid man when her parents past away. On the run from her cousin she take on an identity of a maid to Benjamin Harrington 3rd son of a duke. While Benjamin is sent away to change his ways him and Sophie aka Sarah work togther to fix the estate while falling in love. Wonderfully written storyline with well developed characters that hooked me right into the story from the very beginning and I was totally captivated as the story progressed! I have read a lot of your book and enjoyed ever book they are absolutely amazing I recommend everyone that has a romantic heart to read your books they are so well written you are ASN amazing writer. A fantastic story, full of surprise and suspense. You will love the characters, full of life. The lord would like to change to please his parents and Sophia, the woman he is falling in love. I recommend this book to all that love historical romance and sweet story. I am volunteering to leave a review for an ARC of this book. This was a sweet historical romance. The characters were well developed. Benjamin, the rogue, has a hard time changing his ways. Sophie, trying to escape the unwanted advances of her cousin. Thanks goodness they find their way! What an enjoyable story and a relatively quick read! The development of their relationship through trust and working together was great to follow. I appreciated the conspiratorial support of the other female servants in the households. It was a sweet read right up until a steamy ending. Another of the Duke of Ware's children finds his true love. This has been a very satisfying series to read. (I voluntarily reviewed this advanced copy). Spicy content! While definitely not a sweet and clean novel, I do appreciate this authors delightful characters and imaginative plot. Another fun read from this author. Great characters and plot. Looking forward to book four of this series. Highly recommended. Bad choices and desperation bring them together. A story of finding yourself. You will love not only this book but the whole collection. What a truly horrible uncle. But then you do so need a villain . Ben to the rescue, just in time. This book shows that even when life is dark and grim God always work it out for the good trust Him.